Ideal for the Beovox "S", "C" and "CX" ranges of compact B&O loudspeakers, eg. S35, C30, C40, CX50 and CX100. Also suitable for the classic 1960's Beovox 2500 and "Rondstraler" tweeters. 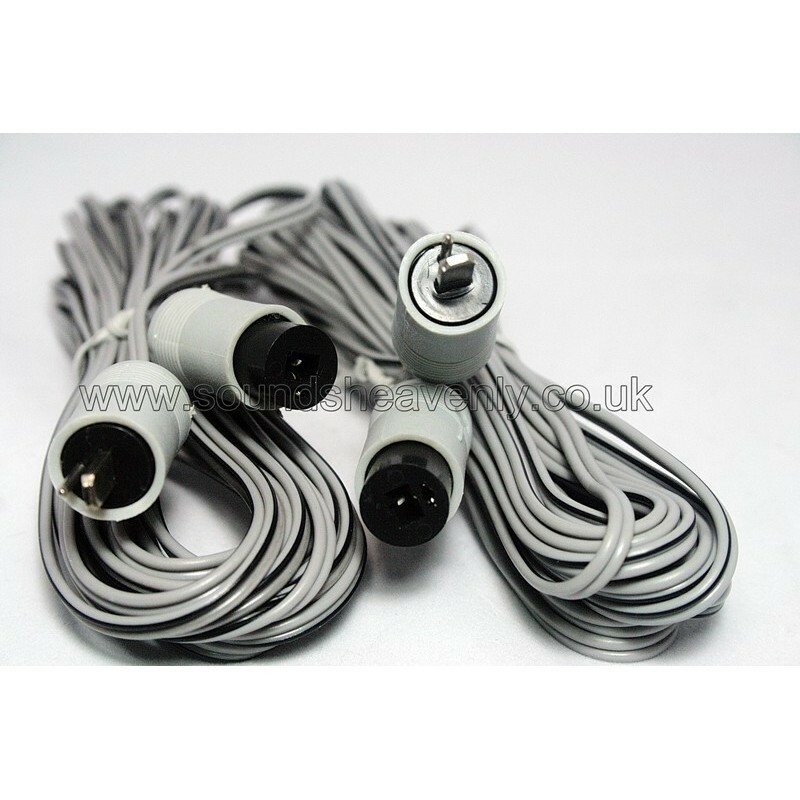 This product is a set of two (2) audio cables to allow you to connect a pair of conventional (ie. Passive) loudspeakers into your Bang and Olufsen hifi system using the 2-pin DIN speaker sockets, where the loudspeakers have either 2-pin DIN sockets, spring terminals or screw-down binding posts. These cables can also be used as "extension speaker cables" if your existing cables are not long enough. Each cable has a 2 pin DIN plug (Male) at one end and a 2 pin DIN socket (Female) at the other end, but these can easily be cut off to give bare ends for connection to loudspeakers with spring terminals or screw-down binding posts, making it suitable for most Non-B&O passive hifi loudspeakers, as well as most B&O Beovox speakers. Slim-line speaker cabling with a figure-eight profile and a grey outer sheath is used, which will allow you to easily hide wiring when planning your equipment installation. This cable profile also reduces cross-talk and impedance to give a clearer, cleaner sound. These cables are ideal for use with the classic Beovox 2500 Cube Tweeters or the even rarer "Rondstraler" omni-directional tweeters. Restore a pair of classic Beovox 2500 Cube Tweeters or "Rondstralers" and connect them into your Bang and Olufsen hifi system using the 2-pin DIN speaker sockets. You will need to disassemble the Tweeters and remove the DIN sockets from the cables to fit the cables, as the cables have to be fed through the stand of the Beovox 2500. These cables are designed to fit through the 2.5mm x 5.0mm gap inside the stand, as they measure approx 2.30mm x 4.98mm (outside dimensions).